Your exterior outlets always come in handy. You can plug in all of your electrical yard equipment to get some yard work done more effectively. Plug in your stereo for the BBQ so that everyone can listen to the big game or dance to the music. There are so many benefits to being able to plug things in outside, but often, our exterior outlets get overlooked when it comes time to maintain your home on an annual basis. The problem with this is that problematic exterior outlets could cause electrocution or an electrical fire. Make sure you follow these tips on how you can maintain your exterior outlets, as an ounce of prevention goes a long way in keeping your home and family safe. One of the first things that you need to do to keep your exterior outlets in good working shape is to inspect them regularly. You want to make sure that the cover doesn’t show any wear or tear, and that the outlet is protected from the elements safely. Check that there are no exposed wires showing. Also, you want to look for any gaps that have opened between the outlet and the wall. You’ll want to make sure that if you do find any holes or cracks that they are repaired if possible or replaced completely. Often, it’s a good idea to have a professional come out to handle these repairs or replacements whether they are in your home or business. They can better determine what the best fix is for the problem, and ensure that your wiring is up to the housing codes. Some of the biggest problems that result in electrical accidents are outlets that are either damaged from use or are incorrectly installed. As soon as you notice a problem with your exterior outlet, it needs to be replaced. That means any cracked or chipped corners should be replaced right away. Outlets that can be jiggled or plugs that are loose when plugged into the outlet can also show that there is some type of damage here that needs to be replaced. You may find during your inspection that while your exterior outlets don’t look damaged, but they may be outdated. Updating your outlets is a great idea. This is the perfect time to get more up-to-date wiring installed. One sign that you need new outlets is if you still have two-pronged outlets as these older outlets should be replaced with three-pronged outlets. Three-pronged outlets are grounded outlets that work better for many electrical appliances. Calling in the professionals when updating your exterior outlets is another good idea because of the grounding wire. 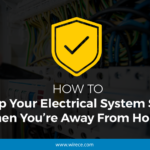 You may find that there isn’t a grounding wire in your outlet to be used with your three-pronged outlet, and this needs to be added before installing these types of outlets. In addition to updating to a three-prong outlet, there’s also the option to use Ground Fault Circuit Interrupter outlets. This is a safety feature that works to prevent electrocutions. It works in that the outlet will stop the flow of electricity if it detects a ground fault. You will also want to make sure that you’re using your exterior outlets safely. You don’t want to use them in inclement weather as water and electricity don’t mix. You also want to make sure that you never touch the outlet with wet hands as there’s a good chance that even with updated plugs you may be electrocuted. Water acts as a conductor and is dangerous to have around your outlet. You’ll also want to make sure that you plug in the electrical plug in securely, and when you’re ready to unplug it, don’t pull it. This can cause damage to your outlet or your electrical plug. This can cause wires to break and plugs to be bent on your favorite appliances, but there can also be potential damage inside of the outlet where you can’t see it. You’ve probably spent a large amount of time putting in little plastic plugs to keep your young children from playing with your interior outlets, but what about your exterior outlets? You’ll want to make sure that your children don’t have access to these outlets, and that as they get older, you teach them to only use a outlet under the supervision of an adult. Problems With Your Exterior Outlets? Are you having problems with your exterior outlets? Wire Craft Electric can help. Our Seattle-based electricians can remove your exterior outlet wiring worries by repairing, replacing, or even updating your current exterior outlets. Need some exterior outlets installed? Right now is the perfect time to have us come out to handle your exterior outlet needs to get your home ready for the coming summer. Spend your days outside enjoying your backyard without worrying about the safety of your outlets. Contact us today to set up your appointment for your exterior outlets.